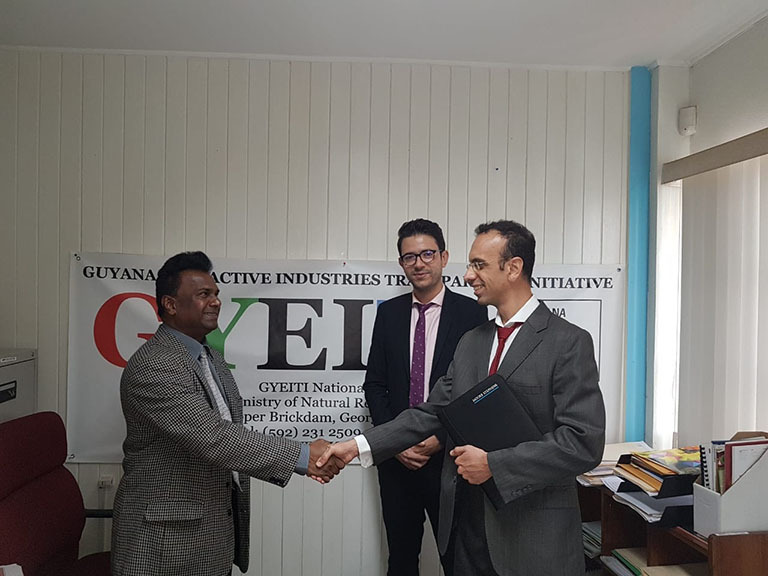 National Coordinator of the National Secretariat of the Guyana Extractive Industries Transparency Initiative (GYEITI) Dr Rudy Jadoopat (left) meeting with two representatives from the International Administrator – Moore Stephens LLP. EITI, which has set a global standard for accountable management of natural resources, is expected to receive Guyana’s inaugural report after the first quarter next year. A first draft reconciliation report on the extractive industry is expected to be completed by the end of November, paving the way for the Extractive Industries Transparency Initiative (EITI) report in 2019, National Coordi-nator of the Guyana EITI Secre-tariat, Dr Rudy Jadoopat says. EITI is recognised as a global standard to promote the open and accountable management of oil, gas and mineral resources. The standard requires the disclosure of information along the extractive industry value chain from the point of extraction, to how revenues progress through the government, and how they benefit the public. The EITI Board approved Guyana’s EITI candidature application at the Board meeting in Manila in October, 2017. 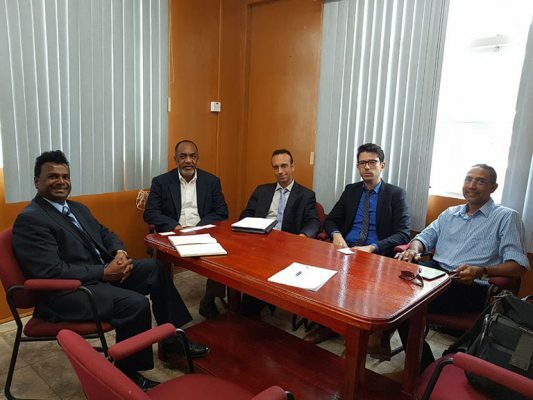 National Coordinator of the National Secretariat of the Guyana Extractive Industries Transparency Initiative (GYEITI) Dr Rudy Jadoopat (left) at a meeting with representatives from the International Administrator – Moore Stephens LLP – along with head of the Environmental Protection Agency (EPA) Dr Vincent Adams (second from left). Speaking to Stabroek News last week, Jadoopat said that Moore Stephens LLP – the international accounting firm chosen to compile Guyana’s report – was in the country from October 7 to 12 and held over 20 meetings with government agencies and private companies involved in the sector. The firm was hired at the end of August. 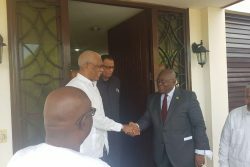 “They met with the Guyana Geology and Mines Commission (GGMC), the Guyana Revenue Authority, the Guyana Forestry Commission, the Guyana Gold Board. 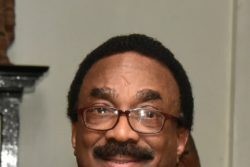 They also met with the NIS (National Insurance Scheme), head of the new Energy Department (Dr Mark Bynoe), the Bureau of Statistics, the Environmental Protection Agency, the Bank of Guyana, Guyana Goldfields Inc… They also met with the petroleum companies including ExxonMobil and a few more such as Repsol, Mid-Atlantic, and CGX, among others,” Jadoopat revealed. The meetings were convened in order for Moore Stephens to brief the relevant stakeholders about their expectations, and what information and data they will need to prepare the first EITI report. “There are many phases and the first phase is to prepare the report, and in order to prepare that report, they have to obtain relevant data and information from the extractive sector. They were here to meet with the government agencies and companies in the initial phase to request data and information,” Jadoopat explained. He said that all of the meetings were cordial and the respective agencies and companies pledged their full cooperation, especially the government agencies. This, he said, shows that the Govern-ment is in full support of the Guyana Extractive Industries Transparency Initiative (GYEITI). 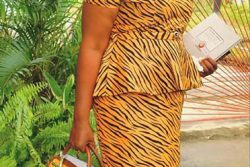 “All the meetings were very cordial because we wrote to them before to request the meetings, official invitations, and responses were all favourable. All the meetings that were requested, were held which is a good thing for Guyana. We also had to make sure that the Government’s commitment to the EITI process is actually met, because if the government agencies do not cooperate, then the commitment is not real, so it was a good thing that all the government agencies pledged their full cooperation and most of them, so far, have already submitted data and information,” he explained. With respect to the information requested, Jadoopat said that Moore Stephens will be looking for any information pertaining to payments that companies in the extractive sector would’ve made to government agencies including royalties and rental fees, among others. A meeting was held with ExxonMobil, who also facilitated representatives from other petro-leum companies. At the meeting, a PowerPoint presentation and discussion was carried out by the IA where the attendees were able to acquaint themselves with the objectives of the GYEITI and the information they will be requesting; as well as what the information will be used for. “For the petroleum companies, since there is no production as yet, the information would not be that difficult to get but we are putting things in place so that when production starts, we will have all the mechanisms for information on production, export, volume and value,” Jadoopat said. Information on the legal, regulatory and institutional framework will also be gathered, which includes all laws relevant to the extractive sector. These will be reviewed. After reviewing the information, Moore Stephens will devise some templates for each agency and company that they will use to submit the information. The templates will first be reviewed and approved by the Multi-Stakeholder Group (MSG) of the GYEITI which includes representatives from Government, industry and civil society. Workshop sessions will also be conducted with the agencies, government officials, companies, the media and all other stakeholders, to inform and educate them on the relevance of the templates, why they are necessary and how to use them. “They also have to do some communication programmes to meet with the public and enlighten them. The report, which is expected to be finished by the end of November, will be like a scoping report and will have a general overview to see what is missing and what needs to be done towards the public,” Jadoopat explained. He added that it will be made available for public scrutiny as soon as it is completed. Because of the upcoming Christmas season, he said that they are trying to start their workshops and other information sessions immediately after the report is produced. 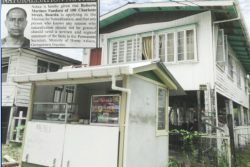 “The International Adminis-trator (Moore Stephens ) is working on a programme for the workshops, collecting data every day, and are analysing all of that and then will tell us a schedule of the workshops and we are going to help them organise it in Guyana to meet with the various agencies, and parliamentarians will also be involved. We are building capacity,” he pointed out. After that is completed, the second phase will start by the end of January where they are hoping most of the templates will be filled out by the agencies and companies. These will be submitted to Moore Stephens and will result in a draft report being completed. That report will then be reviewed by the MSG. “After the review, recommendations for changes, additions, suggestions will be made to improve the mechanisms and procedures for the allocations, collection for data and funds. Then the recommendations from the MSG will be taken by (Moore Stephens) and we will include as much as it requires or is necessary to adhere to the EITI standards to prepare the draft of the final report,” Jadoopat explained. After the draft of the final report is completed, it will be reviewed by the MSG again and when approved, will be submitted to the International Secre-tariat of the EITI for approval, which they are aiming to have finished by April 2019.